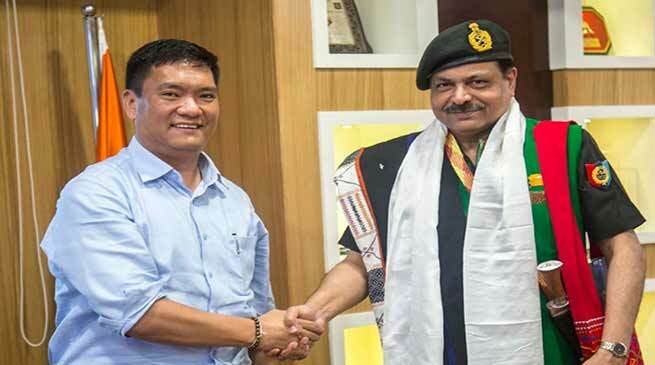 To instil sense of nationalism spirit, discipline and the ideals of selfless service among the youths of Arunachal, Chief Minister Pema Khandu today held a discussion with the top officials of National Cadet Corps (NCC) for its expansion in Arunachal. Major General Raju Chauhan, Additional Director General of NCC of NE region, Shillong led the team of NCC officials. The Chief Minister said he seeks to expand the Indian Military Cadet Corps in all higher secondary schools of Arunachal by raising NCC units in all the uncovered schools. He said upgrading of the 22(I) Coy at Pasighat to a full-fledged battalion and raising of another NCC battalion at Tawang will help in filling cadet vacancies in those schools. He appealed the Govt of India for a separate Group Headquarters of NCC to have better command and control over its two proposed NCC units including the existing Battalion at Itanagar. The CM said it is the vision of Prime Minister Narendra Modi that the Indian Military cadet corps should have its reach in all the border areas of the country. He assured the visiting NCC officials to provide infrastructure, manpower and financial support for expansion of NCC in Arunachal.